We’re almost at 250 fans! When we reach that number, many of our fans will win great prizes. Just click here! Posted in Uncategorized. Comments Off on “Like us” on Facebook! Celebrate Earth Day with “green toys” such as Sprig vehicles and Mary Meyer Fuzz that Wuzz stuffed animals at Becky & Me Toys. You can also find toys from earth-friendly companies Blue Orange Games, Hape, and Plan Toys. Posted in Uncategorized. Comments Off on Happy Earth Day! 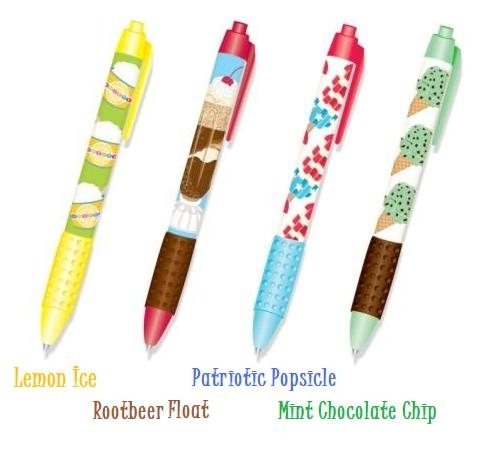 We’re restocked on Smencils and new Ice Cream Flavored Snifty pens. Posted in Uncategorized. Comments Off on Smencils and Snifty Pens! The brand new African Wildlife and Great Dragon Castle series have arrived! Posted in Uncategorized. Comments Off on New Playmobils! Snifty Pens are back in stock with yummy new scents. Between those and the Smencils, the store is quite scented. New Japanese Erasers have arrived! Kids are still collecting Japanese puzzle erasers. We’re so excited about our new order, including colored cows and elephants. We also got new colored pandas and alien babies! Posted in Uncategorized. Comments Off on New Japanese Erasers have arrived! We just got in 15 boxes of Lego and they are out on the floor waiting for you LEGO GUYS and GIRLS to come take them home with you.